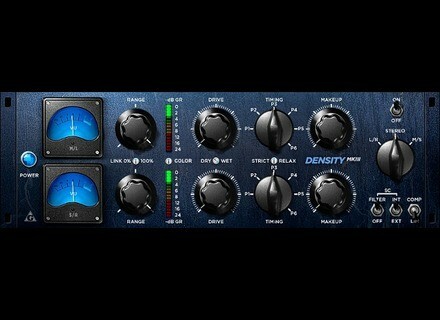 Density mkIII, Software compressor from Variety Of Sound. Variety Of Sound has announced the release of Density mkIII, an update to the freeware Windows VST compressor effect plug-in. It contains color model and IMD improvements. The handling of inter modulation distortion (IMD) has been improved and there is no HF exaggeration caused by this any more. The transient response of the compressor is now more focused and consistent over the entire spectrum reducing coloration artifacts. Instead, a VCA color model has been implemented which can be dialed in as needed, providing a strong 2nd and 3rd order harmonic as well as frequency and load dependent higher order distortion artifacts. The SC filter option was optimized to better decouple the subsonic frequencies below 90Hz. The TIMING presets had been changed and features faster and more modern release time settings. P5 and P6 are introducing true program dependent release time behaviour now. A timing readout is displayed now for about 5 seconds when the according parameters are changing. The COMP mode has been changed and features soft-knee characteristics now. The parameter naming (as seen in host automation) is revised and the parameters are sorted now. The RELAX option has been changed and also allows to speed up the attack times. The linking algorithm has been optimized. Softrave/Syncersoft Boombox VST Softrave and Syncersoft have released Boombox VST for Windows. ExperimentalScene DarkWave Studio v4 ExperimentalScene has updated DarkWave Studio to version 4.0.0. AudioGaming AudioWind & AudioRain AudioGaming has released two new audio plugins, AudioWind and AudioRain.